Additional Info: Javier Bonet began his studies in Spain under the tutelage of his father and Miguel Rodrigo in Valencia. Continuing his studies he accomplished his faculties at Folkwang Music Academy in Essen, Germany, with Hermann Baumann. He also took part in masterclasses of Daniel Bourgue, Philip Farkas, Vicente Zarzo and Ab Koster. – Bonet is a tireless researcher in the field of horn composition and a world-wide sought-after soloist and chamber musician. As a player of the natural horn he enjoys an internationally acknowledged reputation as an interpreter on historical instruments, which are likewise the domain of the ensemble Corniloquio, founded by Bonet himself. He has released numerous recordings of the natural horn on CD , as e.g. four CDs together with ARSIS. Two with the pianist Miriam Gómez-Morán (Tableau Musical and sonatas for horn and piano) and two CDs together with Corniloquio, one of which dedicated to L. Dauprat and the other to J. F. Gallay. In the genre of the French horn his productions with ARSIS have turned out to be outstanding, among which the recordings of Great Romantic Horn Concertos, Romances pour le cor. And for the label VERSO “Naturaleza Humana”, concerto for French horn and orchestra, by the composer Juanjo Colomer. Bonet’s most celebrated recording on video and CD, also for the label ARSIS contain a version of Mozart’s horn concertos played by the Munich Radio Symphony Orchestra conducted by Hermann Baumann. The latest recording, by the title of Just For Fun with Miriam Gómez-Móran at the piano as well, released in 2016 for the new label EXAUDIO contains his own transcriptions of some popular music for piano, violin, cello or human voice. This commendable collection of romantic and virtuoso pieces for horn and piano includes titles like ‘The Bumle Bee’, ‘Monti’s Czardas’, ‘The Pink Panther’, ‘The Swan’ and arrangements of pieces by Sarasate, Tchaikovsky, Chopin, Ravel and Debussy, just to name the most significant ones. Bonet has not only given the first performance of brand-new works by some contemporary composers, but he also excels in the field of chamber music. Furthermore, he is best-known as an ∫experienced instructor on the sector of musical pedagogy. 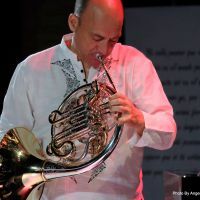 As a horn soloist he has performed with the majority of the famous Spanish orchestras as well as with other orchestras in several European countries and in Taiwan, China, Venezuela, Argentina, Japan and the U.S.A. Highlight his last tour with Miriam Gómez-Morán at the piano, touring the US with a final recital at Carnegie Hall in New York. Bonet has gained great acclaim for the performance of the world premiere of concertos for horn and orchestra by E. Cosma, J. Colomer, M. Constant and for the Spanish first performance of the Ligeti “Hamburgisches” Horn Concert. Only lately the concerto Ab Origine by Salvador Brotons with Bonet and the Orquesta Nacional de España enjoyed its most remarkable world premiere. As a horn teacher Bonet offers regular courses in Spain and at several foreign conservatories in Lisbon, Porto, Paris, Budapest, Berlin, Bloomington, Seoul, Mexico City, Caracas, Peking or Tokyo. As a professor of horn he worked with the Conservatorio Superior de Salamanca and at present holds a chair as a professor of natural horn and French horn at ESMUC in Barcelona. – Being a prize-winner himself in various international competitions he is now active in the jury of the most reputed competitions as they take place in Porcia, Geneva or with the German Radio Corporation ARD in Munich. Javier Bonet is a member of the Orquesta Nacional de España since 1987.